The results of the polls recently held for five assemblies including three in the Hindi heartland are a booster for the Congress that was smarting under the crippling effect of the last general election and also a timely notice to the Modi regime to examine what mid-course corrections it needed to make to regain the earlier levels of support from the highly segmented Indian electorate. Three broad things are clear. First, BJP has suffered a material -though not large -dip in the vote share - it is however, not a decline of the ruling party but a rise of the Congress from the dust as the only other national party that the assembly poll results indicate. This is on account of a certain degree of consolidation of the opposition camp combined with a determined voting by the Muslim minority against BJP. The response pattern of voters was similar across the north Indian states of Madhya Pradesh, Chhattisgarh and Rajasthan showing that factors beyond the matters of local dimension did play a part. A second reading about the poll outcome is that the ruling party’s rural outreach is deficient and that Congress was, in the closing period before the election, able to score over the BJP on issues pertaining to farmers and the agrarian scene in the country. Prime Minister Modi is looked upon as a leader who had seen urban poverty but he did not make waves for visits to India's villages in pursuit of agricultural projects. Farmer's suicides continued after 2014 too but no striking move was announced to tackle this national shame. A timely moderate financial assistance to the farmers facing extreme distress because of an impending crop failure would have cut down the suicide rate and pushed the image of the central dispensation up by several notches. The district collector could have easily been made responsible for identifying such farmers during the harvest months. On the whole BJP has to develop connectivity with rural India in the North to strengthen itself as a truly national party. It has to win the perception war against its opposition in the rural segment. Thirdly, there is no gainsaying the fact that demonetisation caused distress to small businesses, the farm sector and the middle class with the first feeling unsettled by the GST mandate as well. Normalcy has returned post- demonetisation but the recall of the sense of sudden destabilisation remains particularly strong amongst many sections of citizens who are not convinced that the policy achieved its prime objective of neutralising black money. On the positive side the earlier permissiveness about keeping unaccounted money has been broken but the instrument of raids based on intelligence for unearthing black money should be used even more ruthlessly now. Prime minister Modi’s rise on the horizon was primarily because of his personal integrity and willingness to go against the corrupt with an iron hand and it will help his party’s destiny if the regime remained demonstratively strong on this count. Indian masses like a leader with frugal lifestyle, easy access and commitment to national security. Prime minister Modi can easily measure up to this image in the run up to the national electoral contest next year. The supreme court has thrown out the petitions for a probe into the Rafale deal as it has found no reason to doubt the decision making process or see commercial favouritism thus knocking out the rationale for demanding any other enquiry- Parliamentary or otherwise. Congress has however, questioned the judgement and kept up its political tirade against the deal with an eye on the election next year. The next general election will crucially be fought on the Hindi- speaking territory. Congress though making gains will not be large enough as a single entity to challenge the BJP on its own at the national level. History is repeating itself in as much as the alternative to Modi regime can at best be a conglomeration of opposition parties joining hands with the Congress to stitch up an option for the electorate. Some version of the infamous United Front governments that had lasted a few months each after 1996 is what could crop up again. However, unlike those fronts which were at the mercy of the Congress then the regional parties this time around seem to be more assertive and not willing to accept the supremacy of the latter. BJP will be in an illusion to disregard the possibility that it may not be able to keep the tally of 60 in the total of 65 Parliamentary seats in the states of MP, Chhattisgarh and Rajasthan put together and the overwhelming score of 73 out of 80 in Uttar Pradesh alone. Unemployment is impacting the attitude of the youth in these states particularly in UP - they had looked up to Modi's leadership in the last election. They still believe it is PM Modi and not CM Yogi who can do something for them. This invisible anti-incumbency could have been tackled by the government by pitching its skill training programme at the district level to produce employable technicians, paramedics and teaching assistants. Skill training, education and health have been in the poor performance zone and can be said to have failed Modi in the perception battle. The government has still some time left to speed up delivery on the people related projects. Can the BJP add up to its aggregate by making small gains in other parts of the country? 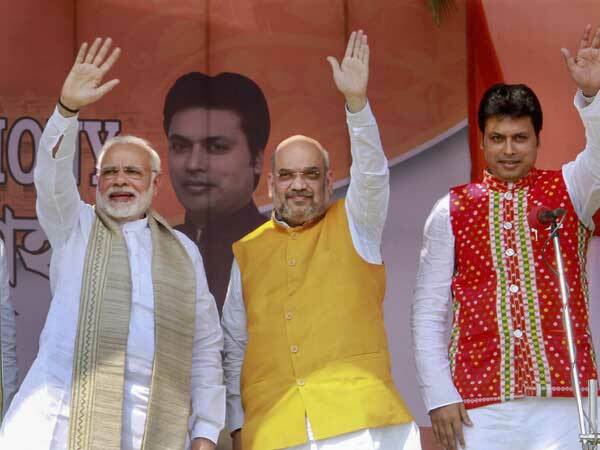 The election strategy of BJP will be formulated around the image of prime minister Modi, firming up of NDA and consolidation of the support of the majority community outside of the political hold of the SP and BSP loyalists. The opposition unity encouraged by the Congress is based clearly on the calculation that if the majority community was deeply divided among the caste- based political parties then the support of the Muslim minority that was nearly one-fifth of the population was a decisive advantage. Among other things therefore, Modi regime has to keep itself totally prepared for a communally charged pre- election environ. Any conjectures on the outcome of the 2019 Lok Sabha election are going to be tinted by political alignments and wishful thinking but a few things are definitely relevant to the question of what the people of India will be guided by. Prime minister Modi's leadership strength is intact and so is his commitment to work. The fact that the present regime had been able to curb rampant corruption is acknowledged. The organisational machinery of the BJP is stronger than before. The Hindu majority in India is impacted by the socio- cultural initiatives of the BJP government and the success of the Modi regime in safeguarding national security and getting India recognised as a world power is appreciated by the common people and the thinking minds alike. However, it needs to be pointed out that while Modi achieved great success abroad he did not put his stamp on the domestic governance- may be for reasons of time and excessive reliance on others. The coming national election will have a varying set of circumstances affecting it in different parts of India. Congress has emerged as a principle opposition but may not yet be in a position to match up to BJP as a national party on its own. However at least an imperfect pre-election alliance or understanding among the opposition could be in the offing. This will make the election a real contest with the residual advantage still lying with Modi's leadership and the BJP’s organisational strength. The run up to the election is going to be both suspenseful and turbulent.